Participating in APA Los Angeles as a member of our Board of Directors or its committees is a great way to get involved in the local planning community, network with other planning professionals, and give back to the profession. We have exciting plans for 2018 and hope you will consider contributing your time and talents to one of APA’s largest, most active sections nationwide! The Los Angeles section of the American Planning Association is one of eight local sections of APA’s California Chapter, with nearly 1,300 members in Los Angeles County. 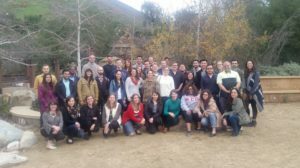 APA Los Angeles helps its members share knowledge, advance their careers, and guide change in both the profession and our communities. To nominate yourself for a Board position or volunteer for a committee, please fill out the Nomination Form with a statement of interest not to exceed 250 words. 12/1 : 2018 Board announced! If you have any questions regarding the positions or the selection process, please contact Ashley Atkinson, Section Director, at director@nullapalosangeles.org. Get involved with your profession in 2018! APA Los Angeles is seeking candidates for the following elected positions for the 2018-2019 term. Each of these positions will be selected by a vote among Section members, and will serve for two years beginning January 1, 2018. The Vice Director At-Large (Awards), along with another Vice Director At-Large, directs the Section’s annual Awards Program and gala, coordinates award submittals for the California Chapter Awards, and chairs the Awards Committee. This Vice Director also assists with the development and implementation of special projects and activities of the Section Board. The Vice Director of Finance prepares the annual Section budget; submits finance reports on a quarterly basis for Board and Chapter approval; disburses funds; receives revenue from programs and events; and maintains student scholarship funds. The Vice Director of Professional Development, along with another Vice Director of Professional Development, develops seminars and symposia for members’ professional development. This Vice Director also coordinates training for members preparing to take the AICP exam and assists the Board with the administration of CM credits. Candidates must be members in good standing of AICP. The Vice Director of Programs, along with another Vice Director of Programs, is responsible for developing, recommending and maintaining an annual calendar of general programs. This Vice Director makes and coordinates arrangements to carry out Section programs and events, including supervision of the Programs Committee. APA Los Angeles is seeking nominations for the following appointed positions for the 2018 term. Each of these positions will be appointed by the Section Director, and will serve for one year beginning January 1, 2018. The Diversity and Inclusion Director prioritizes, promotes, and recruits members to ensure inclusivity and diversity among the Section membership. This Director develops and implements diversity-oriented events and programs, and promotes topics, formats, and venues that diversify Section activities and content. The Marketing & Sponsorship Director administers a sponsorship and advertising program to recruit financial and in-kind support of Section activities. This Director continues relationships with existing sponsor organizations and identifies opportunities for further engagement. The Planning Commissioner Representative develops affirmative programs to increase participation of planning commissioners in APA and their attendance at workshops, seminars and conferences. The position maintains a working relationship with the Chapter Planning Commission Representative. The Public Information Officer prepares, edits, and publishes the bi-monthly Section newsletter, and supervises the Communications Committee. The Public Information Officer provides information on Section events and programs to media outlets and coordinates promotions to generate awareness of the Section’s activities. The Section Historian & California Planning Foundation Liaison maintains a working relationship with CPF regarding scholarships, activities, and fundraisers available to Section members. This position also maintains a working relationship with the Chapter Historians and coordinates Section participation in the Chapter history program. The Section Historian develops programs and media campaigns that promote and reflect on Section and Chapter history. The Social Media Director promotes Section events and announcements on social media. This Director also shares general planning-related content on social media and develops social media campaigns highlighting aspects of Board activities and planning in Los Angeles. The University Liaison maintains relationships with planning schools and programs and their students, faculty, and Student Representatives. The University Liaison assists the Vice Director of Membership in obtaining student and faculty membership, representation, and involvement. The Web Director regularly updates the Section website with event information and announcements, and works with the Public Information Officer to populate the website with blog posts and feature articles. The Web Director ensures that information is available and up-to-date, and assists with marketing campaigns and other communications duties. The Young Planners Co-Directors (two positions) recommend, develop, and promote an annual calendar of programs that meet the educational and social needs of Section members under age 35. These co-directors supervise the Young Planners Committee, maintain a working relationship with the Chapter Young Planners Coordinator, and represent young planners’ interests and concerns before the Board. Awards Committee members assist the Vice Directors at Large (Awards) in coordinating the Section’s annual awards program and gala, held annually in June. Communications Committee members assist the Public Information Officer, Social Media Director, Marketing Director, and Web Director to coordinate Section media, engage in partnerships, and promote Section activities. Membership Committee members assist the Membership Director, Diversity and Inclusion Director, Commissioner Representative, and University Liaison in influencing membership retention and expansion, and in developing affirmative programs to recruit and support a diverse membership. Programs Committee members assist the Vice Directors of Programs and Vice Directors of Professional Development in the planning and implementing of general programming, and developing workshops and training for members’ professional development. Young Planners Committee members assist the Young Planners Directors in the development of programs that meet the educational and social needs of Section members under age 35.